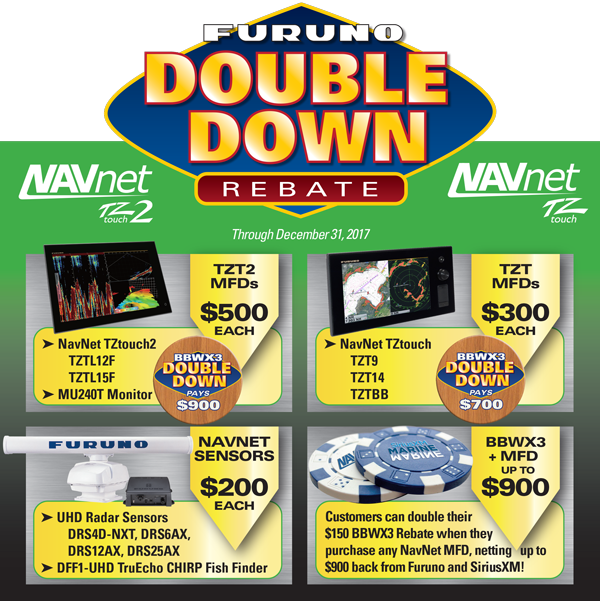 Existing NavNet TZtouch and TZtouch2 customers will be pleased to find $200 rebates on a broad selection of NXT and X-Class Radars, as well as the DFF1-UHD TruEcho CHIRP Fish Finder, as well as a $150 rebate for the BBWX3 Satellite Weather Receiver... all available without the purchase of an MFD! We're also pleased to announce for the first time ever, Factory Refurbished "Blue Star" products are eligible for this very special "Double Down" rebate promotion (subject to availability). A list of eligible products and rebate amounts can be found below, with complete program Terms and Conditions available on the "Double Down" Rebate form. The "Double Down" Rebate has been a great success, because unlike at the casino, there's no risk when you "Double Down" with Furuno! Through December 31st, 2017, everyone is a guaranteed winner. Customers will save loads of cash, while you rake in sales of NavNet TZtouch and TZtouch2 MFDs, MU240T Marine Monitors, NXT and X-Class Radars, TruEcho CHIRP Fish Finders and more! There's never been a better time to upgrade your customer's system with valuable Satellite Weather data, as the BBWX3 SiriusXM Satellite Weather Receiver rebate instantly doubles from $150 to $300 when purchased with an eligible MFD! On top of that, SiriusXM is serving up an additional $100 rebate in the form of a Prepaid VISA Gift Card! There's as much as $4,000 up for grabs with the "Double Down" rebate, easily paving the way for you to close that complete package deal, while your customers pocket some serious cash! For a limited time, purchase a select FLIR M Series camera and receive a FREE Ocean Scout handheld thermal camera by mail. Combine the technology of a FLIR pan and tilt M-Series camera with the compact and rugged Ocean Scout for absolute visibility on the water, day or night! Please read below to see how to qualify for and redeem your Ocean Scout Rebate. 1. Buy a NEW qualifying FLIR M232 or next generation M-Series thermal night vision camera between September 1 and December 31, 2017. 2. Thoroughly and accurately fill out the required customer and product sections. Mail everything to: FLIR Maritime, 9 Townsend West, Nashua, NH 03063, Att: Ocean Scout Rebate. New Boat Customers: If your FLIR products were purchased factory-installed on a new boat you may submit a warranty registration bar code and a copy of your new boat sales invoice in lieu of the UPC and receipt requirements. Please circle the FLIR products on the invoice. 3 bundles offering over 30% savings! Save on hardware & airtime! Winter Boat Show Savings - BRING IT ON. Save on your favorite Icom marine radios from 1/1/2017 thru 3/31/2017.